Level 3 Construction transformed the Holiday Inn Express West Los Angeles hotel to feature a brand new enclosed courtyard, rooftop deck and the brands newest design solution, Formula Blue. 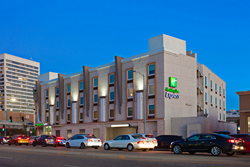 Level 3 Construction has completed an extensive renovation at the Holiday Inn Express® West Los Angeles including upgrades to the 78-guestrooms, public space and exterior. The $4M project has transformed the property to meet the brands newest design, Formula Blue, and to enhance the guest experience in every part of the building. Level 3 worked closely with the hotel’s management company along with the architects to navigate through the construction process and reached a successful completion. Although most hotels remain operational during a typical brand-focused renovation, the large-scale reconfiguration of the public spaces demanded for the property to close during construction. A bulk of this work started with the property’s existing open-air atrium that became an enclosed courtyard to create a new 2-story conditioned space for a new redesigned breakfast buffet area, small kitchen and public restrooms. The exterior corridors on the second and third floors became part of the building’s interior space with views of the new communal area. The 4th floor roof now includes a large skylight and roof top deck with lounge area and landscaping. Exterior improvements included a stylish new color palate to the building along with a new stone façade that enhanced that presence of the entire intersection. The hotel’s lobby area was completely reconfigured with a new registration desk location, lounge area and an expansion to the fitness center. The 78-guestrooms received a refreshing modern upgrade with brand new finishes throughout, a trendy FF&E package, new bathroom tub/shower surrounds, vanities and back-lit mirrors. Interested in learning more about Level 3 Construction and their unparalleled projects? Visit http://www.level3construction.com today. Founded in 2006 by President and CEO Ian Mahon, Level 3 Construction, located in Vista, California, is known for being a leader in hospitality renovation and construction with a growing presence in multifamily, restaurants, office and T.I.’s. Our project experience ranges from small interior renovations and tenant improvements to multi-million dollar ground up construction and renovations. Level 3 collaborates with developers, owners, architects and property owners to implement the most efficient and cost-effective solutions that will reinvigorate a property. Level 3 Construction continues to grow its portfolio of work through quality performance and on-time completion of projects. To learn more about Level 3 Construction’s services, contact John Gonzalez at 760-448-5456 or at jgonzalez(at)level3construction(dot)com.